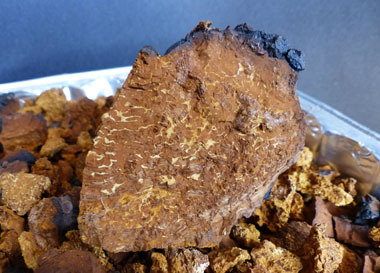 Overview: Chaga is perhaps the most sought-after and easily recognized fungi in the Hymenochaetaceae family. It is parasitic on birch and occasionally on other trees. This fungus causes white heart rot on several broad-leaved tree species. Chaga forms charcoal-black, sterile conks on infected (mostly) birch (Betula spp.) trees. The dark-coloured part of the sterile conk is formed by a pure mycelial mass of fungus. 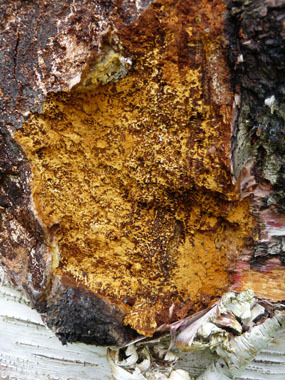 Typically, well-developed chaga are found on trees over 40 years of age. Distinguishing Features: Chaga sclerotium (outer black surface) is what is most noticeable sticking out from the trunk of a birch tree. It is somewhat gnarly in appearance and has a very tough texture. The interior colour is a pleasing amber or a rusty yellow-brown. Height: Once fully grown, chaga can reach up to 50 cm (19”) in width and height and is can have an overhang of about 30 cm. 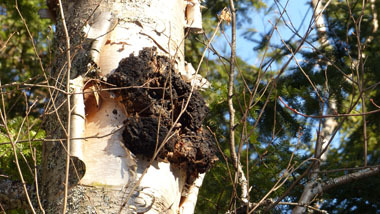 Habitat: Habitat: Chaga is found on living birch trees in the more northern parts of Europe, Asia, as well as in Canada and in the more northeastern areas of the United States. In particular, it is most commonly found on paper (Betula papyrifera) and yellow (Betula alleghaniensis) birch trees. It is also found on cherry birch (Betula lenta) trees that are found in the more southern areas of the U.S. In more northern higher elevation areas, chaga is found on heart-leaved paper birch (Betula cordifolia ) trees. Less frequent host trees include Acer campestre, Acer pseudoplatanus, Alnus glutinosa, Alnus incana, Fraxinus excelsior, Quercus cerris, Q. Petraea, Q. Robur, Q. delachampii, and Ulmus sp. Spore print: The chaga body that grows on the birch has no spores. The major concentration of spores matures in the birch tree trunk underneath the bark, appearing near the chaga buildup when the tree begins to die. When this occurs, chaga spores begin to spread and disperse through the air. When the spores enter the bark of a new host they form mycelium; this eventually destroys the bark creating a new outgrowth and another chaga begins to grow. Season: The optimum time for peak nutrients is in autumn after twenty straight nights of temperatures 5 C (41F) or below. This is when the birch trees are in dormancy. Some harvesters believe the optimum time is when the temperatures hit -20 C (-4F). Harvest through the fall and winter as long as possible until the sap starts running. NEVER remove all the chaga or the tree will be harmed. Harvest only very large conks and leave at least 25% of it on the tree! 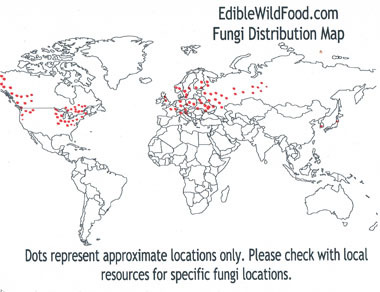 Edibility: Chaga must be broken down into a powder form in order to be added into various meals. When broken into small pieces it can be used to make a nourishing tea. Both the exterior and interior parts of chaga is processed into powder form. Harvest from living trees only! For more in-depth information (e.g. nutrition, medicinal values, recipes, historical information, harvesting tips, etc.) please check out our Chaga PDF magazine.